by April Baer Follow OPB June 8, 2016 11:26 a.m. | Updated: June 9, 2016 7:09 a.m. Researchers gathered samples in fall 2013. USFS says it would like to gather additional data points when funding allows. that kicked off concerns about Oregon’s system of monitoring air quality and air toxics in Portland. Hundreds of readings gathered all around the city are expressed on an interactive map that shows readings taken in 2013. 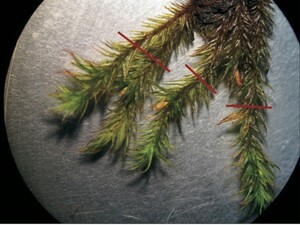 The study examined mosses growing at more than 300 spots in Portland. The foresters then studied 22 elements the moss contained, including six metals that could damage human health. Research forester Demetrios Gatziolis says while the findings suggested pollution hot spots, they don’t provide clear information about air quality. “We presently have no evidence to suggest that any moss-derived concentrations have anything to do with the quality of the air we breathe. The relationship is suggested but not conclusive,” he said. The Forest Service would like to collect more data — the existing information is based on one round of moss collections from the winter of 2013. Since the information about cadmium levels provoked so many information requests, Forest Service staff say they haven’t had time to fully analyze all the results they have. Only the cadmium readings were fully studied. By releasing all the data, the Forest Service says the public may be able to contribute to the analysis. “I’m curious what other people will come up with,” said research forester Sarah Jovan. For their own effort, Jovan said they’d like to nail down how long it took the moss to absorb metals from the air. “We’re not exactly sure what time frame it represents. One thing we’d like to do is flesh out that relationship,” she said. That would mean examining the moss growth rate, Jovan said. The Oregon Department of Environmental Quality announced Wednesday afternoon it would be putting an air monitor in the Cully Neighborhood in Northeast Portland in response to the additional moss data results. Brian Boling, DEQ lab manager, said moss data in the Cully neighborhood showed four metals with high concentrations relative to the rest of the city: cobalt, chromium, aluminum and iron. The Cully site had the highest cobalt detection of all 346 moss samples taken from all over the city, and breathing cobalt can cause lung problems. Boling said his agency decided to put an air monitor at that location because the elevated levels of all four metals could be an indicator of other air pollution problems.